South America, a 'Breeding Ground' for Soccer Corruption? The FIFA logo is fixed on a wall of the FIFA headquarters during a meeting of the FIFA Executive Committee in Zurich, Switzerland, Sept. 25, 2015. The South American lands that are home to some of soccer's greatest players now are at the center of the sport's biggest corruption scandal. The names don't resonate like those of Pele, Messi and Maradona, but they've been part of several generations of South Americans who have run the popular, profitable and murky business of soccer. Two waves of arrests and sweeping indictments in the last six months by U.S. and Swiss authorities investigating widespread corruption in FIFA, the sport's multibillion-dollar world governing body, have snared 13 top soccer officials from the continent, more than any other region. The current and two former heads of CONMEBOL, the South American governing body, are under arrest: President Juan Angel Napout of Paraguay, and former Presidents Nicolas Leoz of Paraguay and Eugenio Figueredo of Uruguay. "The sin of the region, of CONMEBOL, was the lack of sharing of power,'' Chile's leading sports commentator Aldo Schiappacasse told The Associated Press. Decades-long tenures of soccer officials from Brazil to Bolivia "created a wonderful breeding ground for corruption,'' he said. "They were virtually untouchable. They held on to their jobs in a remarkable way. That's why I think the South American case stands out the most. The jobs seemed to go on forever, and that made corruption easier to carry out in our region,'' Schiappacasse said. The corruption dragnet has left CONMEBOL's third vice president, Wilmar Valdez, in line to become its acting president. "CONMEBOL is in a very urgent and complex situation,'' Valdez, who is also the president of the Uruguayan soccer federation, told the AP. Valdez said he would go to the body's headquarters in Asuncion, Paraguay, in the coming days to talk about the future with the few remaining officials who have not been jailed or indicted. They must figure out how to make payments on current contracts and maintain crucial sponsors. During this year's continental championship known as the Copa America, CONMEBOL said it would be forced to use a reserve fund for prize money and other expenses. That's because the company handling rights to the tournament had its accounts frozen as part of the U.S. corruption investigation. One financial savior for CONMEBOL might be next year's Copa America Centenario, which is to be held in the United States and will feature 16 national teams from North, Central, South America and the Caribbean. Stars such as Argentina's Lionel Messi, Brazil's Neymar and Uruguay's Luis Suarez will be there, and the matches are sure to fill large U.S. stadiums with passionate Latin American fans. On Thursday, U.S. Soccer indicated the tournament would go on, despite the sport's current scandal. A close look at CONMEBOL's headquarters in Asuncion, Paraguay, explains much about how South American soccer has been shielded from scrutiny: The building itself was behind closed gates and above the law. Until this year, Paraguayan law gave the headquarters the kind of legal immunity that an embassy enjoys. "The police can't come in, nor can an investigating judge. Nobody can as long as this law is in force,'' Leoz told the Argentine sports daily Ole in 2012. He compared the arrangement to that of the Vatican. A graphic displayed prior to U.S. Attorney General Loretta Lynch making remarks at a news conference to announce a law enforcement action relating to FIFA, in Washington, Dec. 3, 2015. Thursday's 92-count indictment reads like a guide to soccer power on the continent. - From Brazil, Marco Polo del Nero, the president of the Brazilian federation; and former president Ricardo Teixeira, the former son-in-law of Brazilian Joao Havelange, FIFA's president in 1974-98. - From Argentina, Jose Luis Meiszner, CONMEBOL general secretary; and Eduardo Deluca, a former CONMBEOL general secretary. - From Peru, Manuel Burga, a former Peruvian soccer federation president. - From Ecuador, Luis Chiriboga, president of the Ecuadorean federation and a member of CONMEBOL's executive committee. - From Bolivia, Carlos Chavez, CONMEBOL treasurer and president of the Bolivian football federation. 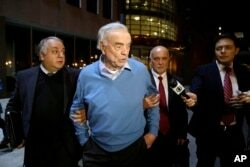 Jose Maria Marin, center, leaves federal court in the Brooklyn borough of New York, Nov. 3, 2015. The Brazilian FIFA official, who was a key organizer of the 2014 World Cup in his home country pleaded not guilty to U.S. charges stemming from a sprawling bribery case that has scandalized the soccer world. - From Brazil, Jose Maria Marin, another former head of the Brazilian federation. 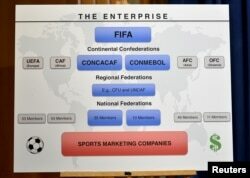 Many of the South Americans have also held positions with FIFA. Also pleading guilty to charges were former Colombian federation president Luis Bedoya and former Chilean federation president Sergio Jadue. Government Attorney Carlos Gajardo, center, speaks to the press, in front of Chile's National Association of Professional Soccer, ANFP, after police investigators entered the building to look for documents and computers from the office of former president of the ANFP, Sergio Jadue, in Santiago, Dec. 3, 2015. As the arrests were taking place Thursday in Switzerland, there was one sign of business as usual in the often shady world of South American soccer. A total of 75 voters cast ballots for either Marcelo Tinelli or Luis Segura. But when the ballots were counted, each candidate received 38 votes - meaning someone voted twice or the ballot box was stuffed.